Some days I’m flush and I forget. I forget I have an illness. An illness that never goes away. That can only be contained. I equate it to living on a high wire. One from which you can never climb down. You are always there, suspended. Make a sudden move and you’re tumbling. And the worst part is not the tumble or even the landing; it’s the struggle to get back up onto that high wire. Because that’s where you are safest, on that thin grey line. What makes me rich is energy. Some days my cup is full. Or at least, half full. “You look great,” my friend says. We are out, dinner and a movie. One of our favorite things to do. And I do feel great. I treat myself to a strawberry margarita. 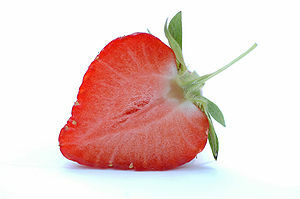 After all, strawberries are anti-inflammatory. I’ve been doing my research. Strawberries are “medicine,” as is chocolate. And what better way to have strawberries than in a tall, cold, rim-salted glass? That was two days ago and now it’s time to make another deposit into that good old energy bank. So soon. Perhaps if I had slept more that night I wouldn’t have leaked out so much energy. But the writing bug bit and I stayed up till the wee hours. Writing is medicine, too. Or at least, therapy. Words have to be my greatest ‘disease modifying drug.’ Reading them and writing them. Forget the chemo; forget the steroid. I take them regularly, my little crutches. Sometimes they make me feel like the women of Star Trek, who became beautiful after popping pieces of colored jelly. As it turned out, that’s all they were. Placebos. It was actually the belief in themselves that made them beautiful. I know my chemical drugs are not placebos and I know they help me, but I cannot rely on pills to keep me up on that high wire. I don’t want to rely on pills. I prefer to think of them as garnish, a sprinkle here, a scatter there. I’d rather the main course be the things I do that make me happy, make me feel worthwhile. Being productive sends my energy level soaring, gives me the balance I need not to tumble or stumble. The catch-22 is, of course, that I must spend energy to make energy. Sort of like, you must spend money to make money. The trick is to deposit more than you plan to withdraw or you end up with a negative balance and no overdraft protection. Which is definitely my case today. So when the question, “What do you want to do tonight?” arose, my answer was, “Rest.” I have learned my limits and more importantly, my limitations. I try to observe them and live within those confines. I have learned after all these years with RA to be faithful to me. Therefore I will rest and refill my coffers; I have a long list of projects and deadlines requiring my attention. And I have no doubt that tomorrow will find me feeling like a million dollars again. For you know what else they say. And maybe next time I’m out, I will try a chocolate margarita. This entry was posted in Coping, Creativity, Happiness, Humor and tagged Chocolate, chocolate margarita, Strawberry Margarita on August 19, 2012 by Irma. Yes, you do have to plan around your RA. Sometimes the day is just not long enough for all you want to do. You have to schedule your rest first and then the things you truly want to do.